If you're a grown human adult, the chances are that at some point you've cooked food. Cooking food is something that differentiates us from other animals, as we've never seen a cat making a Pot Noodle. Not even once. That said, if you feel like you're MORE than human and want to cook in the most modern and technological of ways, read on. 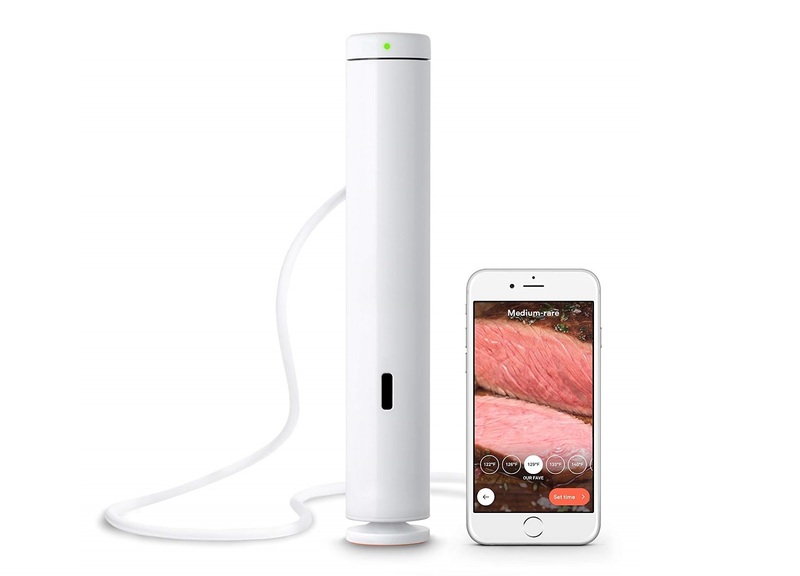 We review the app-controlled cooking sensation called the Joule Sous Vide from ChefSteps. 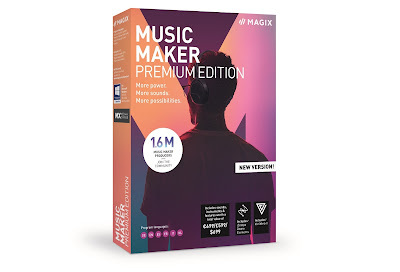 A what? Well, we won't blame you if you've never heard of a sous vide. Essentially these gadgets boil water to the exact degree, meaning you can cook more accurately. To cut a long story short, you put your food in a zip-lock bag, drop it into water, and the Joule Sous Vide takes the water to the exact temperature required to cook whatever it is you want - all controlled from your phone. That's the modern part. What immediately makes the ChefSteps Joule Sous Vide stand out from the crowd is the size. 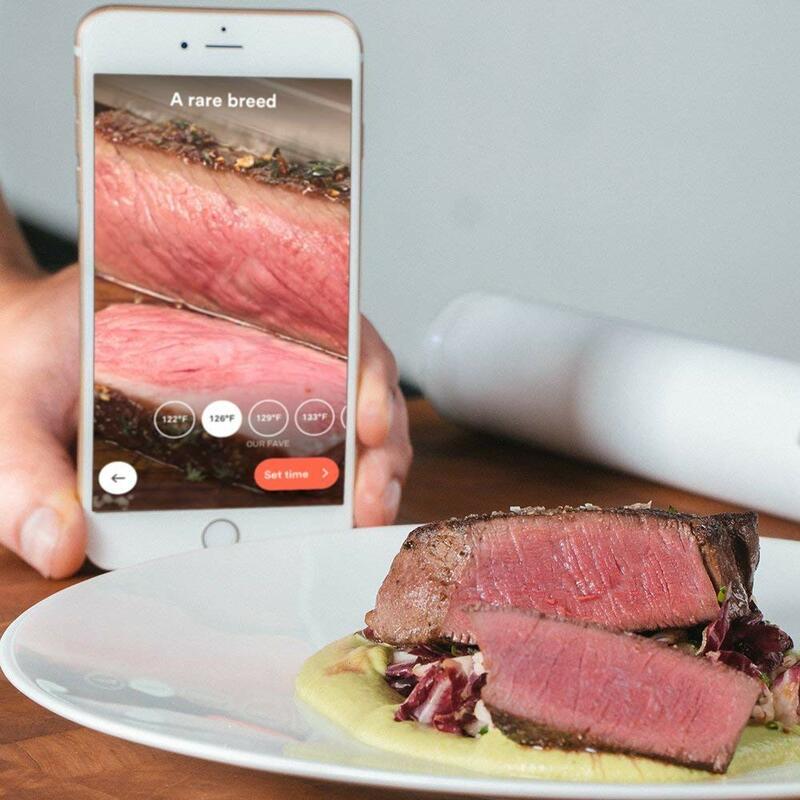 Traditionally sous vide devices were beefy things with digital displays and buttons, while the Joule is small enough to fit in your cutlery draw. All those controls have moved to the app, which connects to the device via Bluetooth and/or WiFi. Set up was easy, and connecting over Bluetooth was as simple as pairing some headphones. All you need then is a fairly large metal pot, whatever it is you want to cook (we went for steak) and some freezer-style food bags. You don't need to vacuum form the bags, just close them. Which, being picky, isn't actually sous vide cooking, and is more 'boil in the bag'. But whatever. The ChefSteps Joule Sous Vide attaches to the base of your pot via a sturdy magnet, and a clip to anchor it to the side. You then plug it in, open the app, and find the right cooking program for what kind of food you want. 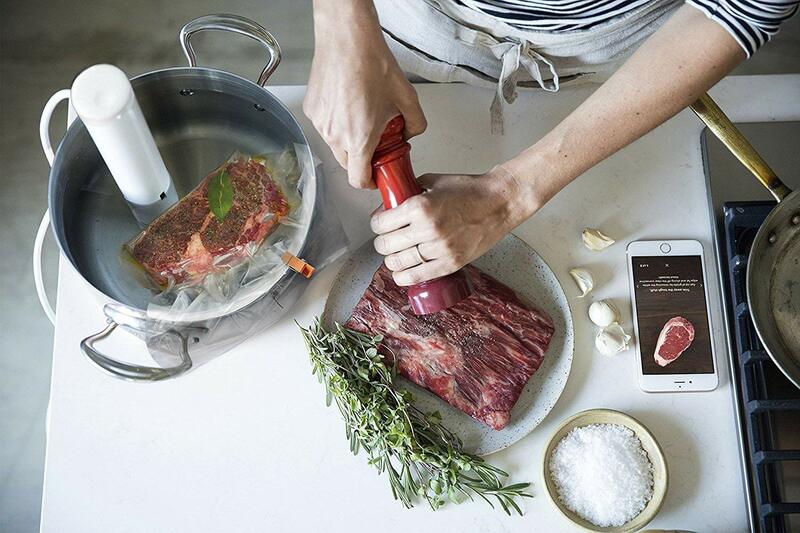 There is a whole host of recipes and programs in the app, but the most simple dealt with the likes of steak. Follow the suggestions for seasoning and garnish, then allow the Joule to heat the water to the starting temperature. Once there, you'll get an alert. So... drop in the steak bag and tap a button in the app to confirm you've done that. The ChefSteps Joule Sous Vide will then keep the water at the correct temperature for the correct time, notifying you once done. However... bear in mind that sous vide cooking takes ages. To cook a relatively small 8oz steak took one hour. Normally we'd griddle a steak like that for about five minutes. Jus' stayin'. Another thing to note was the strange presence of the device itself. During that first hour, when we all got on with other stuff, we could hear a weird bubbling coming from the kitchen. This was the sound of the Joule cycling the water through itself, which caused a gentle amount of splashing. Also, we found that we had to top up the water about half way through, as a fair bit had evaporated. Another thing to remember. Once done (a satisfying ping came from the app) the steak was ready. At this point the app suggested we sear the steak in a pan for a couple of minutes, which only made us feel like we should have just cooked it in the pan in the first place. After all, we are fans of quick-cooking devices. The finished steak looked thoroughly cooked-through, and when sliced open the meat matched the colour of the example in the app. The verdict? Well, okay. It might be that we're just not used to the taste and texture of something cooked sous vide, but it seemed very soft and chewy. The searing had added a degree of toughness to the outer layer, which was nice. However, as we ate we realised that the flavour was pretty intense. Having cooked in a contained bag at a relatively low temperature for a long time meant that all the juices and nutrients were still there. Once we had adjusted to the change in texture, it was bloody delicious. So, the time it takes to cook anything might put some people off, as might the price. But, for special occasions and certain types of food, the ChefSteps Joule Sous Vide produces good results and will take pride of place in any tech fan's kitchen.